Here we recommend some attractive sightseeings, but not the final arrangement, which will be updated in the late of July 2019. 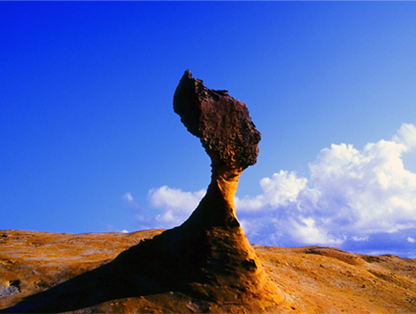 One of the premier destinations in northern Taiwan, Yehliu Geopark is home to a number of unique geological formations including the iconic "Queen's Head", and is located along a cape stretching out from the town of Wanli. The stratum of Yehliu is mainly composed of sedimentary rocks; the formation of sea bays is due to the impact of sea erosion on softer rock layers, while those hard and solid ones may therefore turn into sea capes eventually. The prospect as presented from a long distance view of Yehliu Cape is like a turtle crouching down by the sea; therefore, the cape is also called “Yehliu Turtle”. In the olden days, Yehliu was a key channel of the trade route between mainland China and Keelung harbor. Yet, the waters around the area were torrential and dangerous, and often caused serious shipwrecks. A legend was told that once a turtle elf was making trouble in the sea. A fairly was dispatched by Jade Emperor to tame the turtle elf. The fairy was riding an elephant with a sword in her hand. When she arrived, she yelled at the turtle and said, “What a naughty turtle; how dare you do such evil things and kill so many innocent people. I, bestowed with the power of this holly sword, shall punish you and you shall have no way to escape.” The turtle elf was serious hurt then. After that, whenever the weather changes, people may notice a strand of smoke permeating through the air at Yehliu Cape. And that’s when you’ll hear local people say. “look, the half-dead turtle is making its last breath again”. 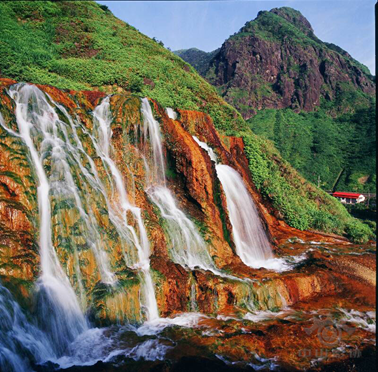 Located in the Ruifang District of New Taipei City, is famous for its gold and copper mines. 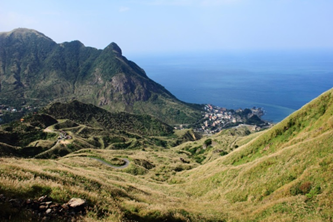 Situated between the mountains and the coastline, Jinguashi boasts exceptionally beautiful scenery as well as an abundance of historical relics from the erstwhile mining days, making it an ideal tourist spot in northern Taiwan. Jiufen, also spelled Jioufen or Chiufen (Chinese: 九份; pinyin: Jiǔfèn; Pe̍h-ōe-jī: Káu-hūn; literally: "nine portions"), is a mountain area in Ruifang District, New Taipei City, Taiwan. Despite the earliest reference to the production of gold in the island dating to 1430, and multiple rediscoveries by early inhabitants, visiting Japanese, Dutch occupiers, and Koxinga's retainers, awareness of the wealth of Taiwan's gold districts did not develop until the late Qing era. In 1890, workmen discovered flakes of gold while constructing the new Taipeh-Kelung railway,and in 1893 a rich placer district was discovered in the hills of Kau-hun that produced several kilograms[a] of gold a day. In the next year, the promise became greater than ever after a Chinese "expert" with experience gained in California found gold-bearing quartz in the said hills. The resulting gold rush hastened the village's development into a town, and reached its peak during the Japanese era. In The Island of Formosa, Past and Present (1903), American diplomat James W. Davidson wrote, "Kyu-fun [Kau-hun] is as odd looking a settlement as one could find. [...] never before has the writer seen so many houses in such a small space. Some appear to be partially telescoped in adjoining buildings, other standing above as though unable to force their way to the group, and each structure seems to be making a silent appeal to its neighbor to move over. "Water ran "in many small streams, directed so as to provide each building with a little rivulet, passing sometimes by the doorway or even over the floor of the building." The claim was owned by the Fujita Company, the first Japanese company to mine quartz in Taiwan and which occasionally made an income of a few thousand yen per month from the Kau-hun gold operations. Many present features of Jiufen reflect the era under Japanese colonization, with many Japanese inns surviving to this day. During World War II, a POW camp named Kinkaseki was set up in the village, holding Allied soldiers captured in Singapore (including many British) who worked in the nearby gold mines. Gold mining activities declined after World War II, and the mine was shut off in 1971. Jiufen quickly went into decline, and for a while the town was mostly forgotten. In 1989, Hou Hsiao-hsien's A City of Sadness, the first film to touch on the February 28 Incident, then a taboo subject in Taiwan, won acclaim around the world. As a result, Jiufen, where the film was set, revived due to the film's popularity. The nostalgic scenery of Jiufen as seen in the film, as well as appearances in other media, charmed many people into visiting Jiufen. For the beginning of the 1990s, Jiufen experienced a tourist boom that has shaped the town as a tourist attraction. Soon retro-Chinese style cafés, tea houses, and souvenir stores bearing the name "City of Sadness" were built. Jiufen also became popular in 2001 due to its resemblance to the downtown in the Japanese anime movie Spirited Away by Studio Ghibli. Jiufen soon attracted Japanese tourists. Many Japanese travel magazines and guide books about Taiwan introduced Jiufen. It became a must visit place among Japanese tourists. However, Miyazaki himself denied that Jiufen was the model city of the movie. 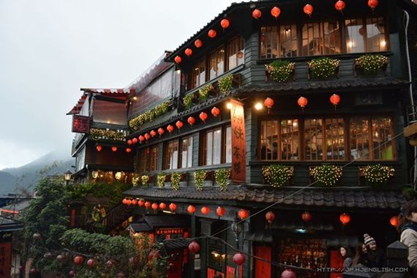 At present, Jiufen is a renowned tourist attraction representative of Taiwan. It draws many tourists from Taipei during the weekends. The Golden Waterfall is a really cool waterfall near the popular tourist village Jiufen and the Gold Ecological Park. The waterfall isn't very big, but it is quite attractive ecologically speaking and if you follow the river downstream it ultimately runs off into the ocean in an area popularly known as the Yin-Yang Sea.